I love the holiday season, but I also don’t pretend to hide that even through all the merriment and cheer, this time of year can be stressful. There’s so much I want to do to makes sure my Christmas celebration is prefect – decorations, Christmas cookies, festivals, lights, shopping, and more. Sometimes I have to sit back and take a moment to remember what is actually important. It’s okay if I’m not able to cross off every item on my to do list or finish a task perfectly. 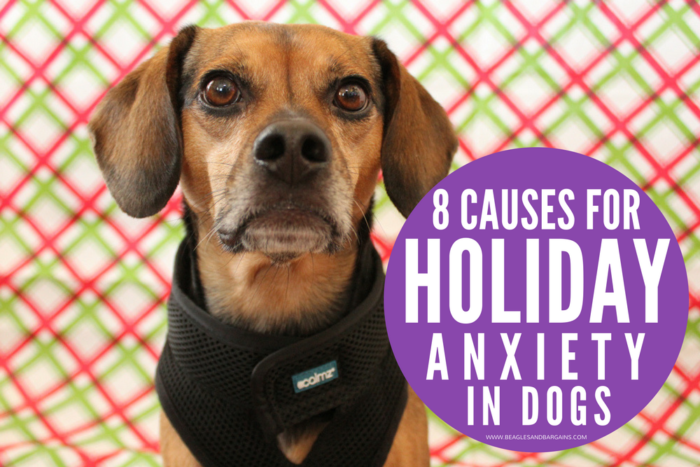 Did you know that pets can experience holiday stress and anxiety too? Though they may not have to do lists or feel like they have to make every occasion perfect, they do pick up on your stress and changes to routine and their environment. Thankfully, we are starting to understand more about anxiety in dogs and even find possible solutions for reducing that anxiety. 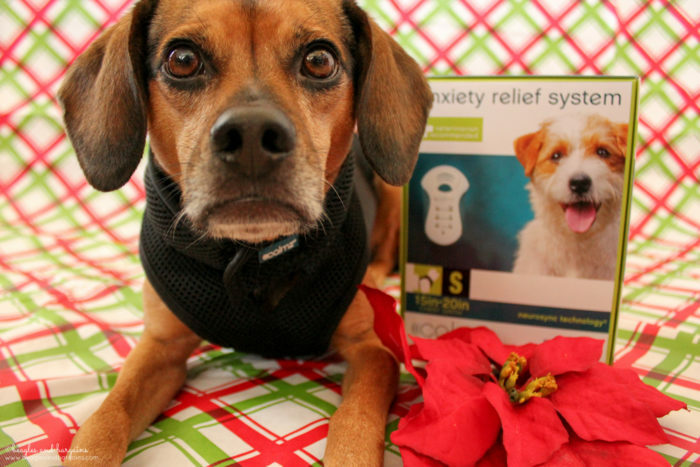 Just earlier this year the CALMZ® Anxiety Relief System by Petmate was launched to help manage and treat pet anxiety. I was intrigued right away. Though I love Luna with all my heart, it wasn’t always a smooth ride after I adopted her. We experienced intense separation anxiety, leash reactivity, and even stressful car rides. 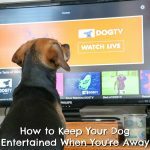 I’m lucky that I was able to work through these challenges with her and find solutions, but I do wonder if I had access to a pet tech device like the CALMZ if that would have been easier. And that’s why I’m so pumped to say that CALMZ by Petmate is our sponsor for Day 6 of our 2017 Stocking Stuffer Giveaways. Read on to find out what may cause your dog to get a little stressed this time of years, so you can help manage the causes. Plus, find out how to enter to win a CALMZ to help reduce the anxiety you can’t prevent. Holiday travel can be fun for the whole family because of exciting new experiences and spending time with those that you love, but it can also be a bit stressful if things go awry. Weather can be unpredictable and there also tend to be a lot more people on the roads (or at airports if you go that route). It also tends to mess up routines (see below) for everyone. Though many of these stressors are more direct for people, travel itself can be stressful for pets. They may have to stay in a small carrier or in the car for long hours. They spend the night in an unfamiliar house or hotel. They encounter unknown people and pets along the way. If you are traveling with your pets during the holidays, make sure to give them breaks as often as you can and bring along familiar items such as a blanket or bed to keep them comfortable. Pets get accustomed to their surroundings and the beautiful Christmas decorations you put up and enjoy may actually be a bit worrisome for them. It may make their home seem not quite as familiar causing them to feel less comfortable. Moving furniture to make your Christmas tree fit – something we almost have to do – may invite their curiosity and even cause them to act out. This doesn’t mean you shouldn’t decorate, but keep your pets in mind when you do. Pay special attention to decorations that have lights, movement, or make sounds. Do you have a dog that barks at or tries to eat your vacuum? I sure do. I like to think that Ralph is trying to protect our entire family from the evil noisy machine that’s come to eat us all. Luna on the other hand goes running into the furthest room to stay away from the monster. Brave as a lion that one is. While cleaning is a necessary evil (especially when you need to convince all your family and friends that your house isn’t covered in dog hair all year round), the loud noises associated with it can cause your pets to panic and pick between fight or flight. Dogs are creatures of habit. They like their meals, walks, and other important activities to occur at similar times each day. Has your dog ever reminded you about dinner an hour early after Daylights Savings Time starts? Though they can be flexible and can adjust over time, a sudden change may make their tummies rumble and create worries and anxiety. Even with all the commotion of the holidays, try to keep your pup on their regular schedule by feeding them and walking them regularly. 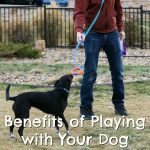 Don’t forget to also take a few minutes for some quality play or snuggle time too. 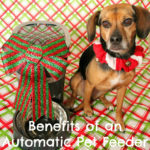 I love nothing more than treating my dogs to some special treats and meals during the holidays. Even with these seasonal specialties, I try to keep them on a regular diets, so their stomachs don’t act up. 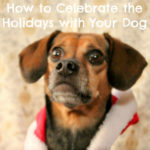 You absolutely can and should spoil your pets a little this holiday season, but keep track of just how much you are spoiling them, so they don’t gain unnecessary holiday weight or develop digestion problems. There’s a lot of research that pets can sense your moods and emotions. Want to read more on this? Visit here and here. Our dogs will try to be empathetic or even sympathetic to our feelings, but it may also cause a bit of stress for them to. If you’re experiencing a very stressful holiday season, just keep in mind how you are acting around others including your pets. Take a deep breath and a few minutes to snuggle. You’ll both be better for it. I love my friends and family, but there is a lot that goes into hosting house guests. Even if you dog doesn’t help with the cooking or clean up, they likely feel it too. Remember that your dog may not know every one you invite and see them as a stranger in their home. Let all your guests know in advance that you have pets and try to introduce them one on one if you get the chance. Also, ensure your pet has a safe place and keep a few chews on hand to keep them occupied throughout the night if need be. Following Christmas, comes New Year’s where we often celebrate by exploding fireworks at night. It can be pretty, but it’s also SO LOUD. Your dog won’t appreciate the beauty of the lights and colors, but they will be bothered by the loud bangs, so keep them at home. If you are unfortunate to have neighbors setting off their own personal displays, try asking them for a heads up, so you can plan a drive with your pet or at least to be at home by their side. If that doesn’t work, you can try soothing your pet by playing relaxing music or using a CALMZ vest. The Calmz® Anxiety Relief System is designed to help combat causes of anxiety for dogs. Some of those causes are listed below, but it can also be used for storms, car rides, and other loud noises (like your upstairs neighbor moving in or playing a game of bowling). According to Petmate, over 24 million dogs in the USA suffer from regular anxiety. If you aren’t sure if your dog is stressed, you can look for common signs of anxiety including panting, drooling, barking or whining, chewing, inappropriate urination, hiding, pinned ears and other unusual behaviors. 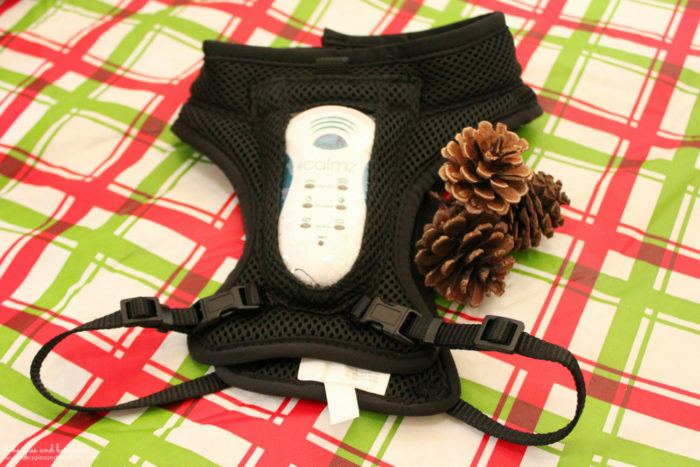 The CALMZ system itself includes an adjustable vest that holds an electronic device over top specific acupressure points on your dog’s spine. These acupressure points were selected from scientific research, which you can learn more about in this video. When the device is turned on, it will create a therapeutic blend of classical music, tones, and vibration to help soothe anxiety through a variety of different preset programs. This is known as their NeuroSync™ Technology and it is clinically proven. 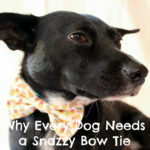 The included vest comes in multiple sizes, so be sure to pick the right one for your dog. The vest itself is also machine washable cold water, but should be air-dried. The device is battery operated with 3 AAA (not included). 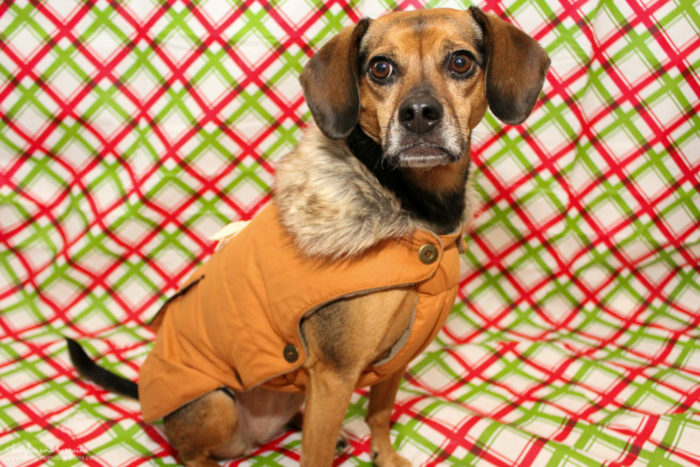 Though you may see improvement right away, you should be sure to take the time to acclimate your dog to the vest and train them to feel comfortable wearing it. In addition to the CALMZ® Anxiety Relief System, Petmate also offers a wide variety of other products from toys to clothing for dogs. Some of our favorites new this year include the Chuckit! Flash LED Ball and the Wouapy Army Dog Coat. If you want to learn even more about Petmate, be sure to follow them on Facebook, Twitter, and Instagram! And follow CALMZ on Facebook, Twitter, and Instagram too! 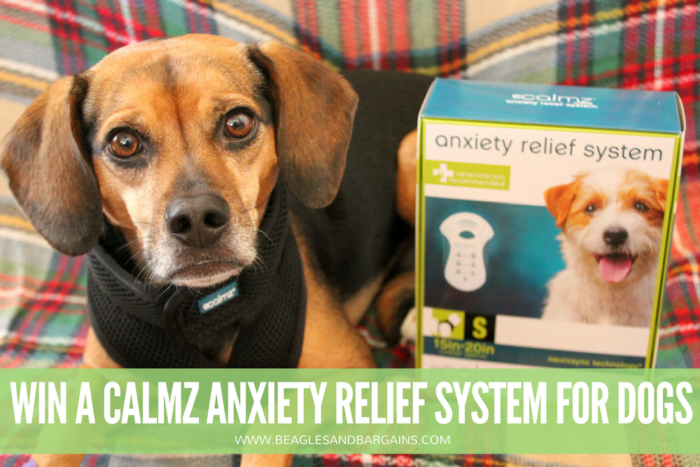 TWO lucky Beagles & Bargains readers will receive a CALMZ® Anxiety Relief System! Residents of the United States are eligible to enter via the Rafflecopter below. Entries must be submitted by 11:59 PM EST on Friday, December 22, 2017. Winners will be notified via email within 48 hours of the giveaway closing and will have 48 hours to respond and claim their prize. TWO (2) winners will receive one (1) CALMZ® Anxiety Relief System. Winners will be able to select the size of the CALMZ pending availability. Approximate retail value is $129.95. Does your dog get stressed or anxious? Tell us what causes it! What do you do to try to relieve the stress? Disclaimer: Petmate provided product free to review. I am being compensated to help spread the word about Petmate. I received no other compensation or additional benefits for mentioning the brands or products in this post. The opinions and ideas in this post are my own and are uninfluenced by any other person or business. Petmate is responsible for all giveaway prizes including shipping.